Canadians store milk in bags, rather than cartons. Surprisingly, they aren’t alone. 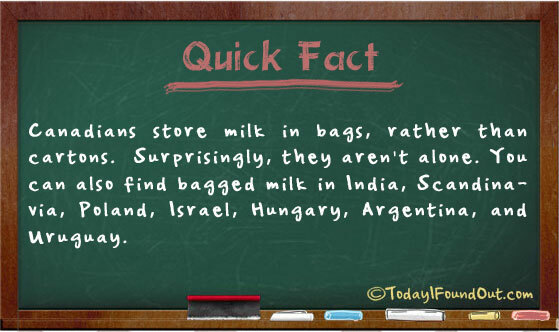 You can also find bagged milk in India, Scandinavia, Poland, Israel, Hungary, Argentina, and Uruguay. I’m Canadian, and I have never seen a milk bag in the ten years I have been living in Vancouver. 🙁 Is this a conspiracy? I have lived in various provinces from Manitoba to B.C. over the years, and bagged milk is available in some places, just not all. I have read that it is more common in Eastern Canada, although I can’t confirm. Add Brazil to that list. Bagged milk is extremely common here, with the carton being pretty much non-existent 20 years ago, but nowadays cartons and bagged milk pretty much co-exist. Funny to remember this after so many years! And mande, I’m an East Coaster, so I’ll say it’s true- it was really common in Eastern Canada, at least when I was a kid! It only comes in bags when you buy 4 litres at a time – one large bag containing three smaller bags (of 1 1/3 litres each). Smaller amounts still come in cartons. Well, I live in Quebec City and we have both bags and cartons! Cartons ??? HOw about plastic jugs? Ummmm…… sorry to burst your bubble here, but I’m from the good old United States and I only buy my milk in bags. You will never believe how much better it tastes until you drink it for a while and then try to go back to milk in a jug/carton. I wouldn’t say it’s common in any of the Scandinavian countries. However, some smaller producers have looked into it since bagged milk can be more ecofriendly. A quick question: what kind of milk is most common (in the US), UTH treated (long shelf life) or “fresh” milk (keeps in the fridge approx. 1 week whether it’s open or not)? I’m a Manitoban, almost forty years old. In my youth we had milk bags, but sometime in my teen years we seem to have switched to cartons and plastic jugs. “All Canadians use milk bags” is the new “Canadians live in igloos”. I live in Toronto, and we have both. The bagged milk is bigger, though. I Live in Ontario and we have milk in cartons, jugs AND bags lol I stumbled across this little tidbit and didn’t realize we were one of the only provinces that do! Also available in Wisconsin, has been for years. You can also find it in Honduras! I’m from Edmonton, Alberta and you can’t get bagged milk at any of the grocery stores here. Depending on the size and brand you can get plastic jugs or cardbord cartons. 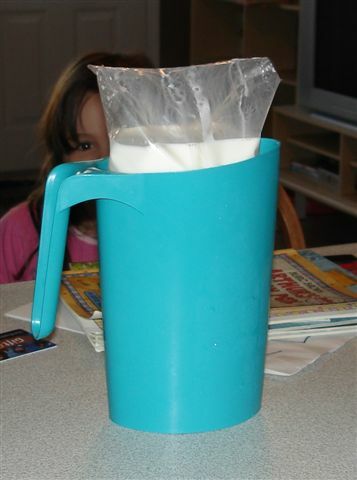 When i was younger and visited my grandma in Windsor, Ontario she always had milk in bags. Her house (and some others i’ve seen both here and there) had small doors that milk bags could be left in. I’m Canadian and I’ve never seen a bag of milk in my life. We have cartons and jugs. I’m from BC, Canada and I’ve never seen milk in bags here… we have it in cartons and plastic jugs. In brazil I know they have milk in bags though and yogurt too. Why is everyone calling plastic milk bottles “Jugs”? they are nothing like jugs… you should call them containers or plain old bottles. I didn’t know that Americans used milk cartons though, I thought they use bottles same as us brits. I lived in India, they have bags there and frankly they are quite easy to use. In Morocco and Algeria there are milks bags. I’m Colombian/Canadian. I Colombia they use milk and water bags. In Canada (BC) we use plastic jugs. This hasn’t been true for probably about 20 years. I remember bagged milk when I was a kid, but I can’t remember the last time I saw it. Our milk is in cartons if it’s in smaller quantities, but typically it’s plastic 4 litre jugs. I haven’t seen bagged milk in Saskatchewan (Canada) for maybe 15 years. seems like it’s just the eastern provinces that do carry milk in the bags. that is what I grew up with. After moving to BC I realised that milk in other provinces comes in gallon plastic cartons. I’m from Ukraine, here is milk in bag is usually thing, but it’s loosing popularity now, trend to the glass and cartons. From Vancouver here. I remember my dad buying bagged milk in the 90s as well as carton milk. Nowadays I don’t see bagged milk anymore. Only cartons, plastic jugs, and glass bottles. This is false. Only some parts of Canada sell bagged milk. I live in the West and have never seen it in my life. I have lived in Barrie Ontario, Calgary, Alberta and Surrey, BC. I have used both milk packets and cartons. In Barrie, I was using a milk pitcher to store milk and in Calgary they use only milk cartons. Now I have moved to India and here they use milk packets as well but not same large size 1 litre milk packets as in Barrie. In India milk packets comes in small sizes 500 ml only. In some countries they say milk bags and in others countries they say milk packets. I honestly dont know which one is the correct term bag or packet. I saw milk in bags at a supermarket in Denmark this week. It is very rare, and almost everyone uses paper cartons for their milk.